How to clean and dry your trainers! Just back from a long run with my lovely training group! Very wet and a bit muddy so here’s a few tips on how to get your trainers sparkling and ready to run again. I simply scrub my trainers with a big brush and water in the shower, rinse them well and let them drip off a while. You could use some washing up liquid if you like your trainers to smell lovely. Those lucky enough to have an outside tap could do this outside to avoid bringing muddy trainers into the house. Never put them in the washing machine! It will result in damage long term. Alternatively cycle home from your run through all the big puddles and they self-clean! 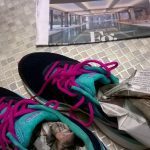 The best way I’ve found to dry my trainers is to stuff them really full of newspaper. I have a dehumidifier so mine will sit in front of it for the rest of the day before removing the newspaper. Alternatively place the trainers near, but not directly on a heat source; radiator, night storage heater, wood burner, open fire, sunny window sill? Whatever you have. For super quick drying re-stuff with more paper. Your trainers soon be ready to hit the road or field again. Why and How to taper for your Marathon race. Tapering is the gradual decrease in training intensity and duration with should start after your last long run. For most people this is three weeks prior to race day. Full taper kicks in with one week to go. The purpose of tapering is to allow your body to recovery from hard training. The muscle fibres need time to fully repair the micro trauma which training causes. This takes time, but with rest, stretching, gentle running, sleep, good food and hydration you’ll arrive on the start time with energy loaded muscles, feeling fresh, ready and raring to go! Rest – you’ll probably feel like you ‘should’ be running, but training effects take around three weeks to appear in your body so it’s too late for tough, long, hilly runs! Just stick to short sessions which keep your legs ticking over. Bank Sleep – you’re a lucky one if you can get quality sleep the night before race day, so try getting to bed a little earlier every night in the week before. Hydrate – Keep yourself topped up with water. It’s essential for improving muscle condition and especially important in the final 48hours, as it will help prevent you dehydrating during the race. Carb Load – try to keep eating well during your taper period. The last 24 hours is the time to add small amounts of extra carbohydrates to each meal and snack in order to insure you have maximum stored energy in your muscles. Stay calm – Employ stress reduction techniques such as gentle walking, swimming, meditation, yoga (if you are used to it! ), visualization and hot baths to help keep body and mind calm. Have a Massage – I would say that wouldn’t I?! – But having run two marathons I can honestly say my pre race massage calmed my mind, relaxed my tight muscles and left me feeling positive and focused. Don’t get injured! – leave trying that extreme sport you’ve always wanted to have a go at until after the race! Just take care and be sensible about the activities you get involved in. Keep Positive – rid your mind of those negative thoughts, focus on the positive ones and surround yourself with like-minded people. Final 24hours – Change nothing! Eat the same as you’ve eaten before long runs in training. Keep to your normal pre long run routine. Even put your trainers on in the normal order if that makes you feel good! Race Day – Focus on YOU and what you need to eat, wear, drink and do to get to the start line ready to RUN! And remember to enjoy the incredible experience that is running 26.2miles! The What, Why and When of sports massage for runners. Sports massage is a combination of basic and advanced massage techniques applied to a sports person in order to support and enhance their performance. Some sports massage therapists can include additional techniques such as medical acupuncture, taping and injury assessment. Each treatment is tailored to the individual, how they are feeling and with a purpose in mind. Techniques also vary depending on when the next training session will take place and how intense it will be. For runners sports massage provides three main benefits; Recovery, Injury Prevention and Psychological Boost. After a tough or long run sports massage will help you to recover faster. It will stimulate blood flow, support your body’s own healing process and prevent or reduce delayed onset muscle soreness. You will leave ache free, with full movement and ready to tackle your next training session. Injury can be prevented by monitoring muscular condition. A sports massage therapist will identify areas of tension with their hands and apply techniques to reduce this and lessen the chances of injury. Your body awareness will improve and you will be encouraged to stretch certain areas at home. Those annoying little niggles need not become full-on injuries! Runners find sports massage provides them with a quiet time to reflect, consider and take stock of how their training is going and how they are feeling. This provides a psychological boost particularly when training is tough or in the week before a race, when keeping the mind and body relaxed is vital. Sports massage can be adapted for use before or after training and racing. Many runners have their treatments after their long run and on a rest day so that the massage can be deeper and assist recovery. But a less intense treatment can be delivered as close to the day before a race. After a race sports massage is applied lightly and more rapidly, in order to stimulate circulation, relax, reduce tension and restore movement. You will leave with less soreness and stairs will no longer be a daunting task! I recently attended a weekend course in Advanced Medical Acupuncture. I learned some amazing new techniques which can be combined with sports massage to enhance the effectiveness of your treatment. So far great results have been seen for patients with tennis elbow, low back pain, calf tension, shoulder issues and upper trap pain. Other issues which respond well to these advanced techniques are joint pain (including arthritis), upper back tension, jaw pain, hand tension and even sinus blockage! Medical Acupuncture is used as part of your sports massage treatment with your full understanding & consent. Here I aim to provide information about all things sports massage and update you with all the latest news. If there is something you would like to hear more about please do get in touch and make a suggestion.